If you are seeking for a high profile Networking profession, be a certified expert with our coaching classes. 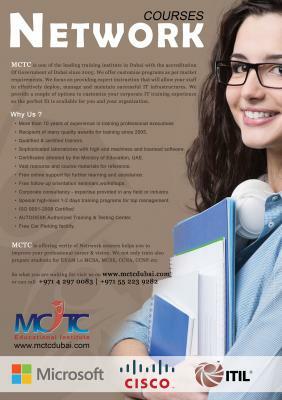 MCTC Dubai have well qualified and highly experienced professionals to help you out completely to achieve your dream job in network field with complete practical sessions. We will prepare you for several Microsoft certification courses including MCSA 2016, MCSA 2012, MCSE 2012, Exchange server 2013 and server virtualization. Our Cisco based courses includes CCNA (routing & switching), CCNA security, CCNA cloud, CCNA cyber security, Cisco cyber security, CCNA data center, CCNA collaboration, CCNA (voice), CCNP (routing & switching), CCIE (routing & switching). Free demo is available for all the courses. Enroll today, start learning from us and become a network expert easily!! Call today and get a free demo session!